Making My 11th Doctor Costume: TARDIS landing on my doorstep! A friend of mine has given me a heads up today. 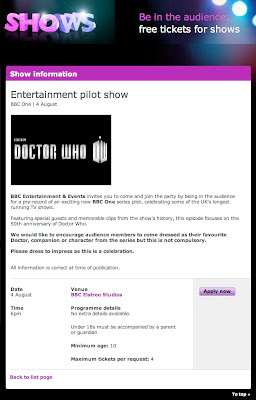 As part of the 50th Anniversary celebrations the BBC are recording a pilot episode of an un-named tv show. Details of sketchy, BUT it’s being recorded at BBC Elstree (the home of Eastenders) which is roughly one mile from where I live. I got to get along - it’s right on my doorstep - besides, they are encouraging the audience to attend in costume. I can’t resist! The classic series has some minor links to BBC Elstree. In 1988 The Greatest Show in the Galaxy was due to be recorded at Television Centre, but an asbestos scare closed the studio due to be used. They relocated to BBC Elstree, where they erreected the tent in the car park and filmed there! Later in 1993, for the 30th Anniversary, Dimensions in Time was shot on the Eastenders backlot set with characters crossing over between the two show. NOT a highlight of anniversary years. Let’s hope this will be more fun! I’m not one for spreading rumours, but there’s a LOT of buzz around now that this pilot show is actually a studio-based reveal of the Twelfth Doctor! Oh! Fingers crossed the new Doctor is as good as Matt Smith... Feeling rather anxious! Any update? What costume are you going to wear? I'm sure you made Mr. Davison jealous! I saw you! You were in your Colin Baker costume! Yes, I was in FULL Six costume! Keeping a flame alive for those classic series Doctors!! Oh man, was that you in your Colin Baker/6th Doctor outfit? I think I saw you on the air for a few glorious seconds. You stood out a light year! I mean mile... I want your 11th new costume. How much?